The mortality rate (number of deaths per 100,000 people, adjusted for age differences across countries) has been falling in the U.S. and in comparable countries. In the next slides, we compare the mortality rates and trends for leading causes of death in the US and comparable OECD countries. Among the major causes of death, the U.S. has lower than average mortality rates for cancers and higher than average rates in the other categories relative to comparable OECD countries. These categories accounted for nearly 74 percent of all deaths in the U.S. in 2015. The U.S. mortality rate for diseases of the circulatory system, which includes heart diseases and stroke, is above the OECD comparable country average. For ischemic heart disease (e.g., heart attacks), which accounts for over 44 percent of the deaths in this category, the U.S. has the second highest mortality rate (113 age-adjusted deaths per 100,000 population vs. an average of 77 in comparable countries) of the comparable OECD countries. For cerebrovascular disease (e.g., stroke), the U.S. has a comparably low mortality rate (43 age-adjusted deaths per 100,000 population vs. an average of 44 in comparable countries). The U.S. and other countries have made dramatic progress in lowering mortality from diseases of the circulatory system. In the U.S., the mortality rate has fallen from 629 deaths per 100,000 population in 1980 to 257 in 2015. Comparable countries have seen a drop from 607 deaths per 100,000 to 215 over the same time period. Circulatory diseases are still the largest contributor to mortality in the United States, but great strides have been made in treatment and prevention over the past 35 years. In 1980, circulatory diseases accounted for more than half (53%) of all deaths in the United States, but by 2015 that share had decreased to below one third (30%). Over that time period, mortality attributable to circulatory diseases decreased 59%. Despite the marked improvements in mortality attributable to circulatory diseases, comparable countries have seen improvements that outpace the United States. Australia experienced the steepest decline of 62% (from 486 deaths per 100,000 in 1990 to 186 in 2015), while the U.S. rate decline 47%. The U.S. morality rate for cancers (i.e., neoplasms) is among the lowest for the comparable countries. Lung, trachea, and bronchus cancers are the leading cause of mortality due to neoplasms, accounting for nearly a quarter of all cancer deaths in the United States. The mortality rate for all cancers (neoplasms) has fallen in the U.S. and in comparable countries over the last 30 years. In the U.S., the age-adjusted mortality rate has fallen from about 242 deaths per 100,000 population in 1980 to about 190 per 100,000 in 2015. The U.S. morality rate for respiratory diseases is above the comparable country average. This category includes deaths from chronic obstructive pulmonary diseases and pneumonia. Mortality rates for respiratory diseases have fallen over the last 10 years in the U.S. and across comparable countries, however both experienced upticks from 2014-2015. Overall, the United States has seen a 6% increase since 1980, while comparable countries have seen a decline of 33% over the same period. The U.S. has a relatively high mortality rate for diseases of the nervous system, nearly double the comparable country average. This category includes deaths from Alzheimer’s and Parkinson’s Diseases. In recent years, mortality rates for diseases of the nervous system have been both increasing and consistently higher in the U.S. than in comparable countries. In the U.S., the age-adjusted mortality rate for Alzheimer’s disease has increased from just under 12 deaths per 100,000 population in 1980 to over 33 in 2015. The sharp increase in mortality in 1999 for the United States coincides with a change in ICD coding. The U.S. has the second highest mortality rate among comparable OECD countries for endocrine, nutritional, and metabolic diseases. This category includes deaths from diabetes (about 67 percent of total). After rising significantly between 1985 and 1995, mortality rates for these disease have fallen steadily, although they remain substantially higher than the average rate in comparable countries. According to the CDC, the prevalence of diabetes in the United States has risen 5% since 1980, likely contributing to the overall increase in mortality seen in the chart. The U.S. mortality rate from mental and behavioral disorders is slightly higher than the comparable county average. Deaths from dementia make up about 89 percent of the deaths in this category in 2015. In the U.S., the increase in mortality from behavioral disorders has been driven by higher mortality attributed to dementia. Since 1980, mortality from mental and behavioral disorders has increased 385%. The U.S. morality rate for external causes (which includes overdoses, accidents, intentional self-harm, poisonings and assaults) is the highest among comparable OECD countries. The U.S. experiences 37% more deaths from external causes than the comparable country average. The average mortality rate among comparable OECD countries for external causes (which includes overdoses, accidents, and assaults) has fallen much more over the last 30 years than in the U.S., where rates initially fell but then started to climb in recent years. Overall, since 1980, the US saw a 9% decrease in mortality from external causes, compared to a 43% decrease in comparable countries. Women in the United States are more than four times as likely to die due to complications from childbirth than women in comparable countries. Additionally, the maternal mortality rate in the United States has risen 113% since 1990. For context, Canada was the only other country during this period to experience an increase in maternal mortality over the same time period, growing just over 60% (from 4.9 to 7.9 deaths per 100,000). Researchers point to multiple factors that contribute to the alarming maternal mortality rate in the United States, including: Racial disparities; a lack of continuity between, or access to, primary care and maternal care services; a need for standardized and evidence-based protocols for child birth and clinical care; and poor data collection on maternal death and patterns of risk. Premature death is an alternative to morality rates and can be measured as “Potential Years of Life Lost” or PYLL. In this chart, premature death is measured by adding together the total number of years that people who died before an specified age (e.g. 70) would have lived if they had lived to that age. For example, a person who dies at age 45 would have a PYLL of 25. As a measure, it provides more weights to deaths at younger ages. The PYLL in the U.S. for all leading causes of death exceeds the OECD comparable country averages. The U.S. and comparable OECD countries have made progress in reducing premature death over the last thirty years. However, the U.S. continues to trail the OECD comparable country average by a significant margin (4,721 v. 2,723 PYLLs per 100,000 population in 2015). Researchers have looked at mortality that results from medical conditions for which there are recognized health care interventions that would be expected to prevent death. While the health care system might not be expected to prevent death in all of these instances, differences in mortality for these conditions provides information about how effectively health care is being delivered. Mortality amenable to health care dropped in the United States by 21.3 deaths per 100,000 from 2004 to 2014, but these were the smallest gains among comparable countries. The United States was still experiencing almost 40 more deaths amenable to health care than comparable countries in 2014. The Healthcare Access and Quality (HAQ) Index is based on age-standardized, risk-standardized mortality rates for 32 causes amenable to health care. Based on data from the Global Burden of Disease Study, the HAQ Index is scaled from 0 to 100: lower scores indicate high mortality rates for these causes, while higher scores indicate lower mortality rates and thus better quality of and access to health care. Researchers report that both the U.S. and comparable countries improved rates of mortality amenable to health care from 1990 to 2016. 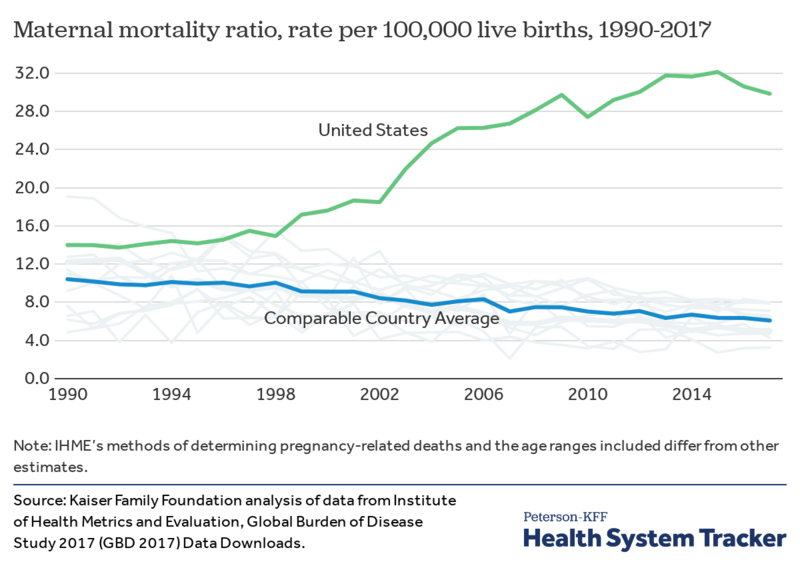 Though both have improved mortality amenable to health care, the gap between the U.S. and similar countries has widened. On average, comparable countries saw a 15% increase in the HAQ Index during that time, while the U.S. saw a 10% increase. Lower mortality rates for circulatory diseases (heart disease and strokes) are driving the decline in U.S. rates over the last 35 years. Mortality rates for cancers have also fallen, while rates for mental and behavioral disorders (primarily dementia) and diseases of the nervous system (including Alzheimer’s disease) have risen.